Apples to Applique: Yeehaw! A Western Party! We were blessed with a good sleeper, so we hadn't had to use this trick for three or four months, and then about two weeks ago Little Girl was overly tired and throwing a fit about going to bed. I thought surely she would have forgotten or changed her preferences, but nope! Daddy turned on Redheaded Stranger and our Lil' Gal was out like a light. I don't know what it is about Willie Nelson; we've tried dozens of other artists and songs, and none of them have the magic. So, as an ode to Willie and the nights he helped us get through, we had a Western-themed birthday party. 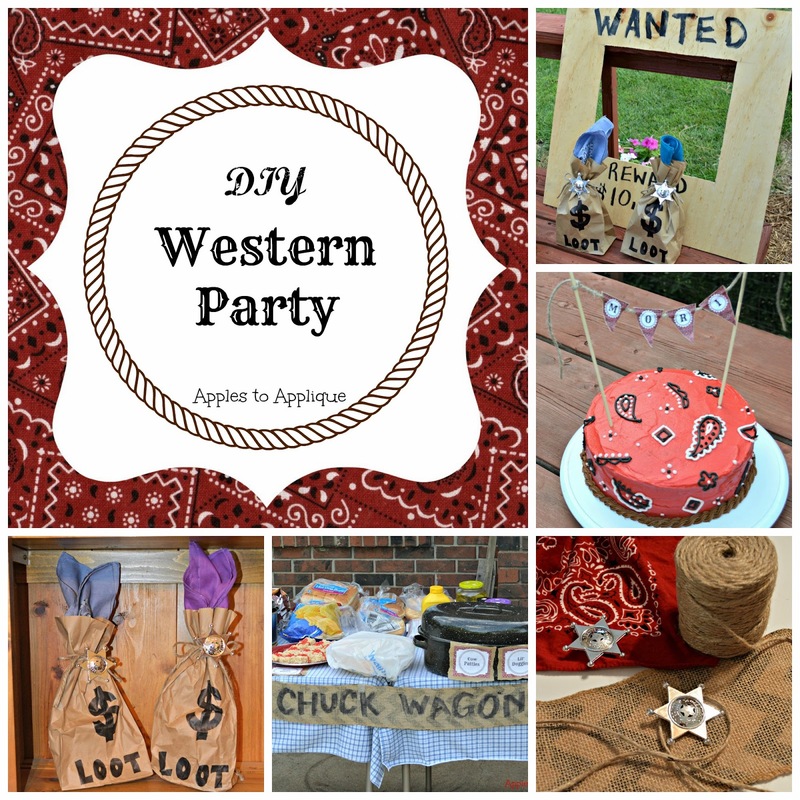 This party was so much fun to put together, and I'm going to have several upcoming posts over the next few weeks with more details on how you can throw a western party for cheap. Today, though, I just wanted to give you the highlights. Here's our beautiful birthday girl with her daddy! I just love her little outfit; stay tuned for an upcoming post with more details on making a bandana skirt! What's a Western party without a horse? 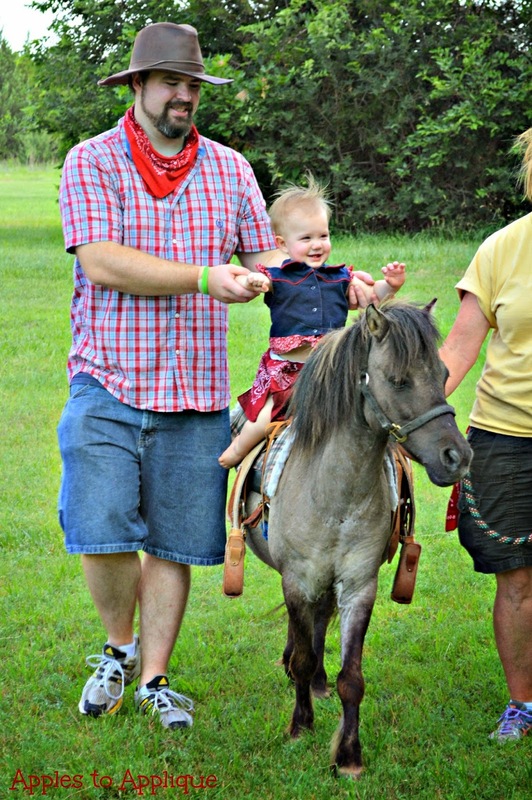 We hired a local ranch to provide pony rides. All of the kiddos had a great time riding the pony; I'm so glad we decided to spend the money on it, although it was actually really reasonable. To any of you in the Wichita area, I highly recommend Four Points Ranch and Petting Zoo! They provided great customer service, and were excellent with all of the little toddlers at our daughter's party. ...with fun Western-themed foods, like rice krispie hay bales. Stay tuned for some free printable Western food labels, coming soon! To keep with the theme, we served food in "tin plates". This kid is too darling! And, of course, no birthday party is complete without cake! I decorated her cake to look like a bandana, with a lasso border. She didn't hesitate at all before digging into that cake! ...and then she just tore into it. She was starting to get so tired by that point, bless her little heart. But she managed to eat an alarming amount of cake! We finished up with some fun themed pictures. How much does this little girl look like her daddy?! Seriously. Then we broke out the mustaches, and had way too much fun with that! Everyone joined in the fun, from kiddos to great grandparents. And, of course, before our guests left, they received favor bags. Brown paper lunch sacks turned loot bags--talk about easy and cute! The party was a success, and our guests seemed to have a good time. I'm so looking forward to sharing with you some more about the party over the next few weeks. Make sure you don't miss these upcoming posts; subscribe to my email list or follow me on social media; the buttons are at the top-right corner of my blog. Thank you! Oh, my goodness! So stinkin cute! And that cake is amazing. Pinning! Super, SUPER cute! I love the photos and the props were a great touch! Thank you! I had so much fun putting the props together. This is great! You really did a good job. Your daughter will have fun looking at these pics when she's older, especially. I love all your ideas! Pony rides! How fun is that! Everything ... the cake, the goodie bags, the Wanted posters ... Sweet! That cake is AMAZING! Such a cute party! Amber your daughter is so cute. =) My son just had a birthday recently as well but he turned two. I love how creative you are with parties, I really wish I could do that as well, it looks awesome. Aww, two is such a fun age! This party was easier to put together than it looks; I'll have some posts coming up with free printables and tutorials. Great party! Looks like it was a great success. I love the cake, came out really good! Thank you! I was thrilled with how the cake turned out. This is SO cute! You thought it out so well, and covered so many basis! I love the "WANTED" photos even! I haven't even considered a themed birthday for my son so far because of the cost involved, but when he's a bit older and can actually appreciate it I am going to have to figure out some DIY stuff since it seems the most budget-friendly, and then has a huge bonus of being personal and more original, too :)! There's nothing about that I didn't love! From the VERY adorable children and great cake - it was a joy to read. Thanks for sharing! Pinning! Thank you! I agree the children are pretty adorable. ;) I appreciate the pin! Oh so cute! It looks like she really enjoyed her cake :-) I'm getting so many great ideas from this post! Love the wanted poster idea... might be using that one myself! Haha, oh man, she ate SO MUCH cake! I'm glad you enjoyed the post; the wanted poster was definitely a hit with all of the guests! Wow how cute is this. My nieces birthday is in a few days and we are still struggling on the theme. I just love the western flair. The family photo part was perfect. I can't wait to see more on the birthday skirt. Thank you for allowing us the chance to celebrate her special day with us! Hahaha! I told my husband that when she's bigger and asks for a pony for birthdays or Christmas, we can tell her, "We already got you a pony!" This is so fun! I'm glad you all had a great time and I totally am with you on not giving your kid red frosting! That would be a mess. Love it! Thank you for making this available!